There is a famous American legend about a shipwreck, which tells the fate of the vessel known as the Princess Augusta, better known as the “Palatine”, and her 150 passengers. Those aboard were among the remaining survivors of a group of Germans seeking a life free of religious persecution in America, when the ship ran aground at Sandy Point, along the northernmost tip of Rhode Island, in 1738. They burned the wreck of the Palatine. This story, it is believed, may have been part of the inspiration for John Carpenter’s 1980 horror film, The Fog, in which an eerie, luminous fog appears over a coastal California town, possessed with the spirits of a group of mariners who died near the location a century earlier. Carpenter was also inspired by visits to England’s famous sites around that time; this included a stop-off at Stonehenge, where the filmmaker and his companions recounted seeing a particularly eerie looking fog as it rolled in from the distance. While Carpenter’s tale of a murderous fog has seen various incarnations over the years, lesser known in America is the story of a real killer fog that beset London only a few decades ago. Variously known as the “Great Smog of London”, or “The Big Smoke” as it is also referenced, the events began on December 4, 1952, as a yellowish-black fog descended on the city of London, whose eerie color garnered the nickname “pea-souper”. Despite the prevalence of fog over London, as is traditionally known, this fog was so dense that visibility was reduced to mere yards, making such poor visible conditions that public transportation was grounded, and a number of public events, particularly those scheduled for the outdoors, were cancelled or postponed. 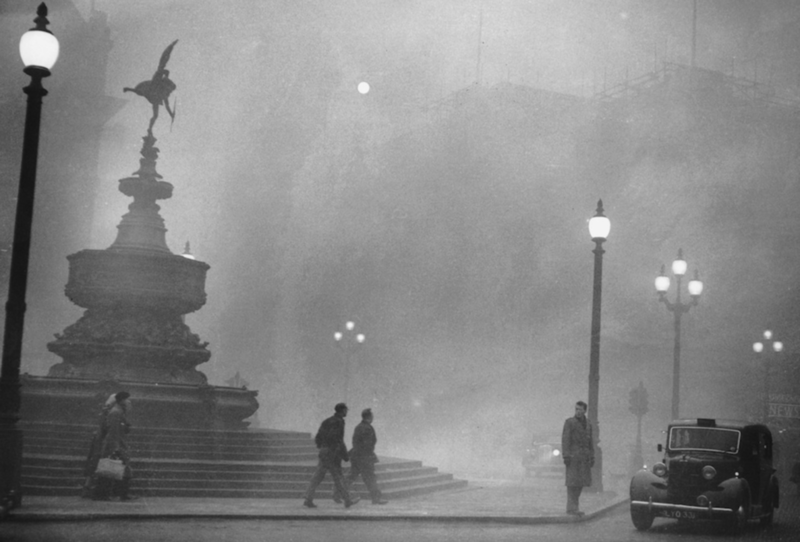 Thick fog descended on London in early December of 1952, although its adverse health effects on the population, as well as its ultimate cause, would not come to light for decades. Although the health effects of the fog weren’t immediately apparent, statistics later indicated that the inhalation of what had apparently been toxic fumes, thick with a number of pollutants, had likely caused up to 4000 deaths. More recent figures, however, suggest as many as 12,000 may have been affected by the deadly fog, and despite its massive impact on the population, its exact cause has long remained a mystery. However, recent similar pollution-based fog over parts of the Eastern world, especially in China, have helped modern scientists pinpoint what the likely cause of London’s killer fog had been. A new study appearing in Proceedings of the National Academy of Sciences suggests that there are indeed similar conditions that are conducive to dangerous or deadly fogs today. Renyi Zhang of Texas A&M University coauthored the paper with a number of graduate students from China, California, Israel, and other locations, suggest that sulfuric dioxide that was released as pollution into the air were subsequently turned into airborne sulfuric acid particles. This resulted in an immovable, and very deadly lingering fog, when paired with meteorological conditions conducive to an anticyclone (that is, as the name implies, a weather system which behaves opposite to that of a cyclone, often leading to clear skies and cool, dry air. However, when humidity reaches nearly 100% during such conditions, fog will likely form). Thus, the mystery of the real-life “killer fog” of London appears to have been solved. Of course, in addition to solving the mystery, the new scientific insights into what caused it, and the detrimental affect it had on the population that endured it for several days in 1952, should serve as a wake-up call in terms of furthering our efforts at curbing environmental pollution in the years to come, and developing new ways to effectively avert such occurrences in the future.